Peter Wagner co-founded the Prison Policy Initiative in 2001 to document and publicize how mass incarceration punishes our entire society. Our staff members shape national reform campaigns from our office in Western Massachusetts. The Prison Policy Initiative is known as a go-to source for timely, actionable data about our criminal justice system. We work to grow our movement by bringing in new supporters and making existing allies more effective. Our insightful data analyses and powerful graphics are designed to reshape tomorrow's debates around mass incarceration and over-criminalization. 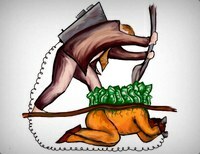 Bringing fairness to the prison and jail phone industry. Some children had to pay $1/minute for a call home from an incarcerated parent. Our research and advocacy led the Federal Communications Commission to lower the cost of calls home from prisons and jails. 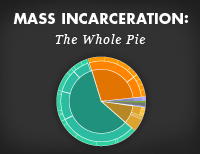 Uncovering the big picture on mass incarceration with Mass Incarceration: The Whole Pie. This report assembles data on everyone who is incarcerated or confined in different kinds of prisons, jails, and other correctional and detention facilities in the U.S. The main graphic has become the most widely-used visual in the field. Demonstrating that incarceration in every state — even those with relatively progressive policies — is out of line with the international community with the report and interactive graphic States of Incarceration: The Global Context. Protecting our democracy from the undue influence of the prison system. Our campaign against prison gerrymandering has changed how legislative districts are drawn in four states and 200+ municipalities. Protecting family visits from the predatory video call industry that seeks to replace traditional in-person visits with expensive video chats and grainy computer images. We've won in Massachusetts, California, Texas, Illinois, and Portland, Oregon, and we continue to fight to protect families and enact lasting change nationwide.